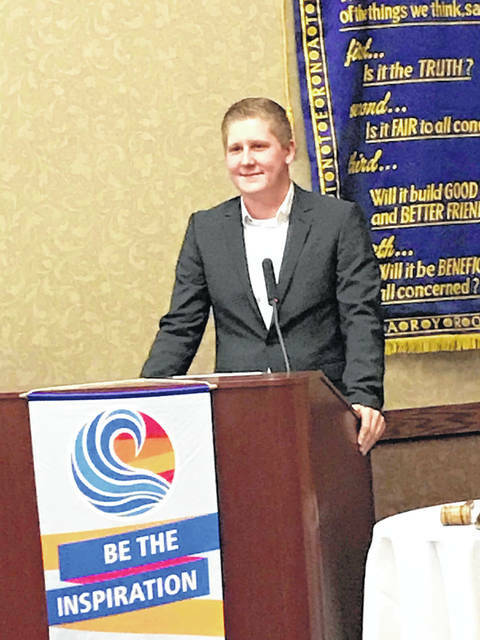 German exchange student Max Boensch, 17, addresses a meeting of the Portsmouth Rotary. The above were two of the lighter topics on the mind of Max Boensch, 17, a native of Bitterfeld-Wolfen, a mid-sized German town of about 47,000. Max is spending the better part of 2019 in southern Ohio as this year’s Rotary Club of Portsmouth foreign exchange student. Max made a brief presentation to the Rotary Club during their January monthly meeting held Monday at Shawnee State University. The young German is apparently an avid soccer player back home. He did note, however, German youth sports teams are not connected with public schools as they are here. In fact, Max said he was surprised by the emphasis local schools put on athletic activities. On a related note, Max did not hesitate to say he definitely will be watching the American version of football when the Super Bowl kicks off this weekend. Regarding chocolate, Max didn’t say the American variety is necessarily better than German chocolate, but he did say it is far more varied. On a somewhat more serious note, Max said he experienced his first Thanksgiving here in Portsmouth. The holiday doesn’t exist, of course, in Germany. Max spent the Thanksgiving holiday with one of his Portsmouth host families, that of Dennis and Christy Wilcox. During an informal discussion following Max’s presentation to the gathered Rotarians, Christy Wilcox talked about roasting an entire pig for Thanksgiving among other traditions possibly somewhat unique to her family. For his part, Max said he enjoyed the holiday adding there certainly was plenty of food. “Maybe a little too much food,” Max joked. Max of course also spent Christmas here in Portsmouth. While he said he missed his family, spending Christmas away from Germany was enjoyable and he did not regret missing the holiday back home. While in this country, Rotary exchange students spend a few months with one family then move on to another. Max has or soon will be leaving the Wilcox family. While compared with German schools, American schools might be more organized in terms of sports, according to Max, schools in his native country are more academically challenging. Firstly, his class schedule changes daily. Back home, he is studying 16 subjects. Max said he wanted to come to the U.S. for two specific reasons. First, he wanted to improve his English. Secondly, he just wanted to learn more about American culture. For the record, he told the Rotary members he loves the United States. The two things he misses most from back home, he added, are his friends and his cat, the latter of which he showed a picture of on the projector in the SSU ballroom. While Max will be in Portsmouth until June, the Wilcox’ son Caden, 16, is spending time in Germany until the end of August. “He’s having the time of his life,” mom said, adding he had just been on a skiing trip in Austria with other Rotary exchange students from around the world. Also on hand for Monday’s meeting was a former Portsmouth Rotary exchange student who also spent time in Germany. Jacqueline Meriweather is now 21 though she was in her teens when she visited Germany through the Rotary. She seems to be putting the experience to practical use studying German language and speech pathology at Miami of Ohio University. Meriweather plans to return to Germany to study at the University of Munich in April.